Lore pointed to one of the most ridiculous products I've ever seen. Why would you buy one of these instead of a regular coffee mug? You might be thinking to yourself that this is going to save a bunch of paper sleeves. It'll cut down on litter and save the environment. You would be wrong. 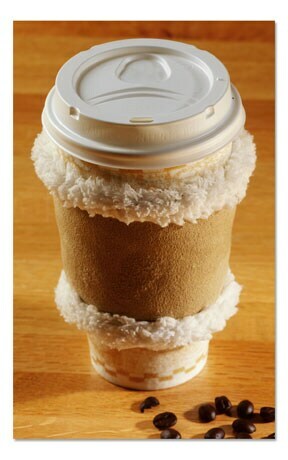 A regular sleeve and cup are made out of paper and will biodegrade. The cup's plastic lid on the other hand will last thousands of years. How many of those have you tossed into the trash? Perhaps for sanitary reasons because you would fail to wash the regular mug. This would be even worse with the sherpa sleeve. Think about all the little dribbles that would collect in that fake lambs wool. Think of all the wondrous colors it will turn from the coffee, the oils on your hands, and the grime currently found in your cup holder. I'm sure it wouldn't stink at all. Do they call me McGregor the coffee maker? do you have to burst every bubble? You know yuppie elitist's think this is the coolest thing ever, now they can accessorize their coffee to match their outfit, how wonderful!!!! where is my pink Izod polo? Have you seen it, Muffy?